AS SHETLAND College, the NAFC Marine Centre and Train Shetland prepare to merge next year, the University of the Highlands and Islands (UHI) is appointing non-executive members to a shadow board to oversee the process. A number of non-exec members will join representatives from Shetland Islands Council, the NAFC, the UHI as well as staff and student representatives on a board that is expected to have between 13 and 18 members. UHI representative Max Brown described the role of board member as pivotal in developing the strategic aims and in ensuring sound stewardship for the new merged college. “This is an exciting opportunity to be part of the board during a period of change for the future of further and higher education in the region,” he said. More information and contact details can be found here. THE MODERATOR of the General Assembly of the Church of Scotland will be in Shetland this weekend to meet local people, preach at the first ever Shetland-wide united service and lead a Palm Sunday procession through Lerwick. 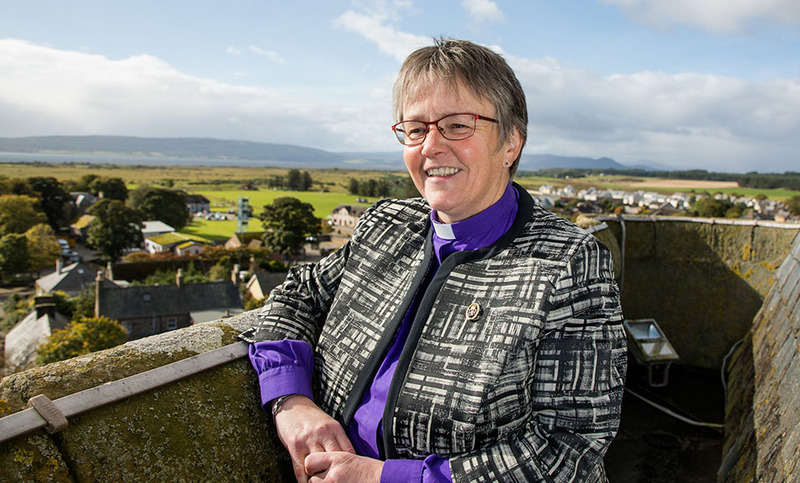 On Saturday Rt Rev Susan Brown will meet with Rev Frances Henderson, the Church of Scotland’s transition minister for Shetland, before spending the evening at a local ‘Meet the Moderator’ event at Voe Public Hall from 6.30pm onwards. A Palm Sunday procession and service will be held at St Columba’s Church in Lerwick on Sunday, with the procession starting from 10.30am and the church service from approximately 11.15am. The church service will be the very first Shetland-wide united service, anticipating the future single parish on Shetland. 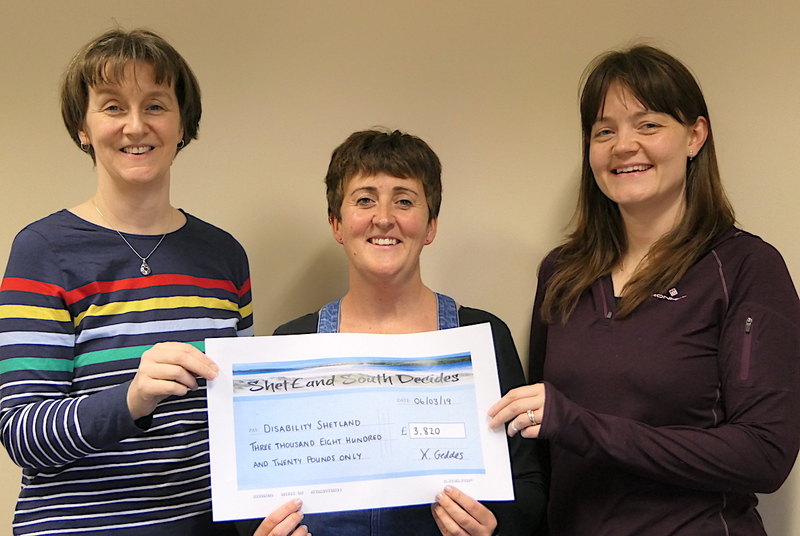 Stephanie Bain of Disability Shetland receiving her cheque from Karen Osborn (left) of Sandwick community council and Kerry Geddes of Gulberwick, Quarff and Cunningsburgh community council. THREE community projects in the south of Shetland are now up and running after receiving funding under the community choices initiative. A total of £30,000 was up for grabs in November when south mainland communities came out in force by voting for their favourite projects. Of the £30,000 of community choice money available £15,000 is going to the South Mainland Up Helly Aa committee to build a galley shed in Sandwick. 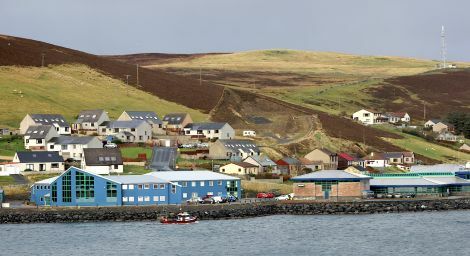 Disability Shetland, meanwhile, has received £3,820 for an all-terrain wheelchair to be kept in the south mainland, and Cunningsburgh Village Club is using its £11,180 to install a new heating system and complete work to bring the building up to standard. All projects which got through to the voting stage had to clearly show how they would help to improve the lives of people in the south of Shetland, linking in with the Shetland Partnership Plan. A MIXED exhibition of art and design work by three different groups of students from Shetland College UHI – Enterprise & Events, Forward Directions and the Wednesday Natural World Art Group – is currently on display at Shetland Museum and Archives. 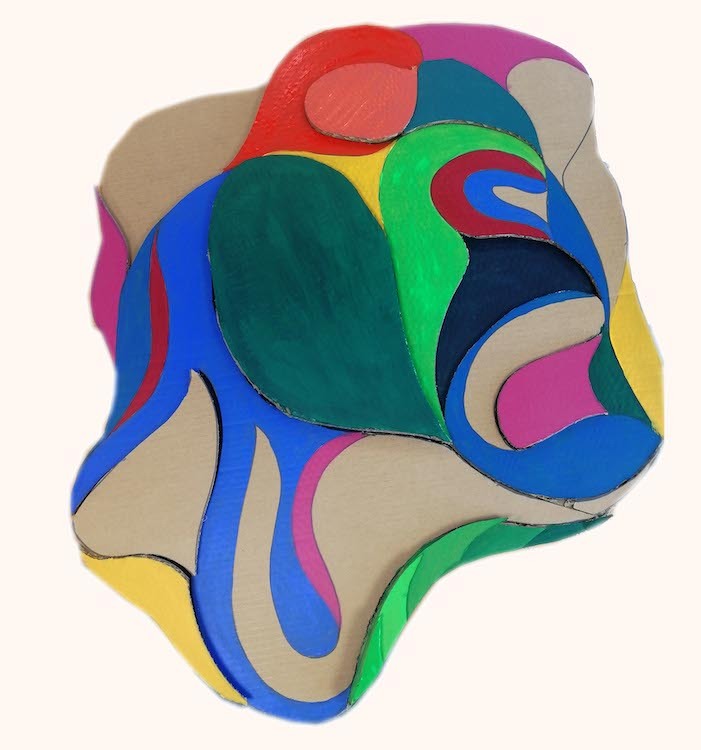 The exhibition runs until Saturday 27 April and includes the Clyde Arc, buoys from Whalsay, swirling abstraction and small sculptures of the land. QUENADALE Mill is opening its doors for the visitor season on Monday (15 April). The refurbished watermill, which started grinding grain more than 150 years ago, is run by volunteers from the South Mainland community history group and is open daily from mid April to mid-October each year. A short video shows the milling process from start to finish and it is an essential part of the mill tour. Thereafter, descriptive boards in each room explain how the machinery works and the process the grain goes through. This year’s seasonal display is on birds and wildflowers of Dunrossness, provided Mike Kemp and Donald Robertson. SCOTTISH Opera will be making a return visit to Shetland early in 2020, it has been announced. As part of their 2019/20 season the opera company will bring their ever popular Opera Highlights to Lerwick. The varied programme of music curated by Scottish Opera’s head of music Derek Clark sees four singers and a pianist perform works by Mozart, Rossini, Donizetti and Gilbert & Sullivan, and a new piece by Scottish Opera composer in residence Samuel Bordoli. The performance will be held either in February or March next year. Dates will be confirmed in due course.